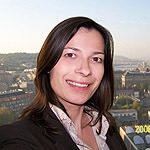 She has been working as adult learning co-ordinator at the Centre for Learning Innovation and Adult Learning of the Budapest University of Technology and Economics since 2003. She is responsible for the central tasks of adult learning of the university and quality assurance. She graduated from the Szeged University in 2000 as MA in Philosophy. Her professional experience started in 2001 at the Eduweb Distance Learning Co. Ltd., Budapest, where she worked as a consultant (from 2002 as senior consultant) of learning development till 2003. She gained status as expert at the Public Foundation of Apertus on the field of ODL, adult education and quality assurance in 2004. From September 2006 until the end of 2007 she was appointed as Membership Officer for the European Foundation for Quality in E-learning and since 2008 she works as Project Officer at the European Distance and E-Learning Network (EDEN). Her language command includes English (fluent) and Serbian (good).